Not to be confused with Nakuru County. Nakuru is the fourth-largest city in Kenya after Nairobi, Mombasa and Kisumu. It is the capital of Nakuru County and former capital of the Rift Valley Province. It had 307,990 inhabitants within its town limits by 2009, making it the largest urban centre in the Kenyan mid-west with Eldoret in Uasin Gishu following closely behind. Nakuru lies about 1,850 m above sea level. Clockwise: Sunrise in Nakuru, Flamingos in Lake Nakuru, Avenue Suites Hotel, Baboon Cliff, Nakuru Skyline, Merica Hotel and entrance to Lake Nakuru National Park. The history of Nakuru can perhaps be traced to the prehistoric period due to the archaeological discoveries located about 8 km from the Central Business District at the Hyrax Hill reserve. Nakuru is Kenya's 4th largest urban centre with a population of 307,990. 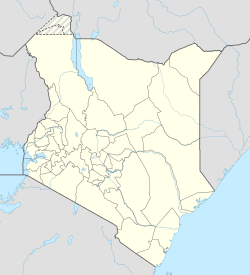 (The modern town, as with many others in Kenya, derives its name from the 'Maasai' speaking people of Kenya.) Nakuru was established by the British as part of the White highlands during the colonial era and it has continued growing into a cosmopolitan city. It received township status in 1904 and became a municipality in 1952. The city of Nakuru is situated in Nakuru County, Kenya. It lies 1850 meters above sea levels on the highlands of Kenya giving it a climate similar, albeit a bit colder, to Nairobi. Like most rift valley cities, Nakuru enjoys a temperate climate throughout the year but temperatures fall significantly at night and during the cold season of June to August. The city has a warm-summer Mediterranean climate (Köppen climate classification Csb). Agriculture, manufacturing and tourism are the backbones of the economy of Nakuru. The area surrounding the city is known for its vast agricultural potential with numerous small farms and also vast agricultural enterprises.The main crops grown around Nakuru and marketed in the city include coffee, wheat, barley, maize, beans and potatoes. . These crops are stored in massive silos at the outskirts of the city by the National Cereals and Produce Board and Lesiolo Grain Handlers Limited. The crops provide the primary raw material for the manufacturing industries found in Nakuru and Nairobi. These industries include flour milling and grain ginneries. Dairy farming is a key economic activity and provides the inputs for various milk processing plants around the city. Other manufacturing industries include Menengai soap factory, Car&General Motorcycle plant, Eveready Battery plant, Fertiplant East Africa and many more. The city also prides itself on being the home of Kenya's largest retail supermarket chains. Nakumatt, Naivas, Tuskys, and Gilanis supermarkets were all founded in the Nakuru. According to a UN study released in 2011, Nakuru is Africa's fastest growing city and the fourth in the world. Nakuru is also an important educational centre. It is the home of Egerton University, a large public university, and Kabarak University, a private university associated with former President Moi's business and religious interests.Molo Academy (both primary and secondary)school are located here) The Rift Valley Institute of Technology is also based here, as is the Kenya Industrial Training Institute (KITI). The Kenya Institute of Management (KIM) has a college branch in Nakuru. Nakuru is now becoming a centre of academics with campuses for the University of Nairobi, Kenyatta University, Jomo Kenyatta University of Science and Technology, Mount Kenya University, Laikipia University, Kenya Methodist University being set up in the city. Other important institutions include The Institute of Advanced Studies, Kenya Institute of Biomedical Sciences and Technology (KIBSAT), Institute of Advanced Technology (IAT), Tracom College, AIRADS,Savannah Institute for Business and Informatics (SIBI) and most recent Nakuru Training Institute (NTI), which is a project of Nakuru Christian Professionals Association. The institute, popularly known as Centre of Hope trains youths at moderate fees and offers full sponsorship to the needy in the community. It partners with Nakurun Lapset (Finland) among others. Mwangaza College, initially called the Bishop Ndingi Centre for skills formation, is also another known college in Nakuru. Nakuru is also a home to numerous public and private secondary schools. Public schools include Nakuru Boys High School and Nakuru Girls High School formerly Nakuru High School founded in 1926 as a school for European settler children, and Menengai High School and Nakuru day secondary school. There is a well stocked public library run by the Kenya National Library Service. Nakuru hospital is one of the largest in the county previously the biggest in Rift Valley province. It is also home to the Nakuru War Memorial Hospital opened shortly after world war 1 by Norman Jewell to commemorate troops both African and European. Nakuru is home to the Lanet Airstrip that was, in 2017, approved for upgrade to an international airport by the ministry of Transport and county government. Nakuru is also home to Kabarak Airstrip located 20 km away from the city center. Dondori road C86 linking the city to central Kenya. The Eldoret-Nairobi highway passes through this city linking Uasin Gishu County with the capital city which is Nairobi. The RvR (rift valley railway) narrow gauge track runs through the city with a railway station located on the edge of the CBD. it connects to cities of Nairobi and Mombasa to the east and Kisumu and Eldoret to the west. Nakuru is home to Lake Nakuru, one of the Rift Valley soda lakes, which forms part of the Lake Nakuru National Park. The park has large numbers of flamingoes that can be seen foraging in the shallow lake. The park also has many wild animals that can be seen during a safari. Apart from the animals, numerous other sites of interest are accessible from Nakuru. These include Menengai Crater, a dormant volcano. Small fumaroles and steam vents can regularly be observed within the forested caldera from above. The second largest surviving volcanic crater in the world, it plunges 483 m down from the rim and the summit is accessible by foot or vehicle 8 km from the main road to Nyahururu. The wood-covered crater ground is a nature reserve. Hyrax Hill Prehistoric Site, discovered by the Leakeys in 1926, is considered a major Neolithic and Iron Age site. The adjoining museum features findings from various nearby excavations. The food culture of Nakuru includes a variety of local and international cuisines. Afraha Stadium is a multi-purpose stadium in Nakuru, Kenya. It used mostly for football matches and is the home stadium of Nakuru AllStars of the Kenyan Premier League and Ulinzi Stars of the Kenyan Premier League. The stadium holds 8,200 people and opened in 1948. The stadium is two kilometres from the famous Lake Nakuru National Park. Even though it is a football stadium, it became famous for hosting many political meetings including the GEMA promoted change the constitution series held in the 1970s. The former ruling party KANU also held many prominent meetings there during the Moi era. Nakuru also offers a great experience and opportunity for local skaters that are easily notable in the Maasai market area on weekends. The maasai market also caters for Nakuru's growing skateboarding scene. A motor racing track, Nakuru Park, (not to be confused with the Langa Langa circuit near Gilgil) operated in the Lake View Estate area from 1956 until the mid 1980s. Nakuru is populated by people from the whole of Kenya and from many regions of the world. The population is predominantly Kikuyu and Kalenjin but it has a cosmopolitan feel. The city has a sizable population of Kenyans of Indian origin and a few of the original settler families have also remained in the area. As per 2009 Kenya Population Census Nakuru had the fourth largest urban population in Kenya. ^ "Kenya | U.S. Agency for International Development" (PDF). Kenya.usaid.gov. Archived from the original (PDF) on 23 February 2013. Retrieved 10 December 2013. ^ "Nakuru – Kenya – Margiti! The Market Place". Margiti.com. 20 March 2012. Retrieved 10 December 2013. ^ "Africa | Curfew after Kenya town clashes". BBC News. 25 January 2008. Retrieved 10 December 2013. ^ "World Weather Information Service – Nakuru". World Meteorological Organization. Retrieved 31 August 2016. ^ Galpin, Darren. "Nakuru". GEL Motorsport Information Page. Retrieved 24 April 2013. ^ "Nakuru – City of Kenya". Sphere Info. Sphere Info. Retrieved 19 August 2015. Wikimedia Commons has media related to Nakuru. Wikivoyage has a travel guide for Nakuru.